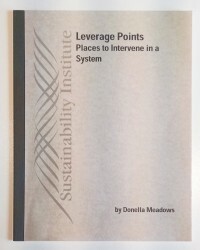 The resulting article, “Leverage Points: Places to Intervene in a System,” is the most-accessed resource in our archive and remains an inspiring teaching tool in universities and graduate schools around the world. Today, Dana’s systems insights are more applicable than ever. To facilitate access to Dana’s wisdom, we are developing experiential, modular curricula (in-person and online) for educators in higher education and community leaders interested in exploring how systems thinking, leverage points for change, visioning, and reflective conversation can enhance their work. 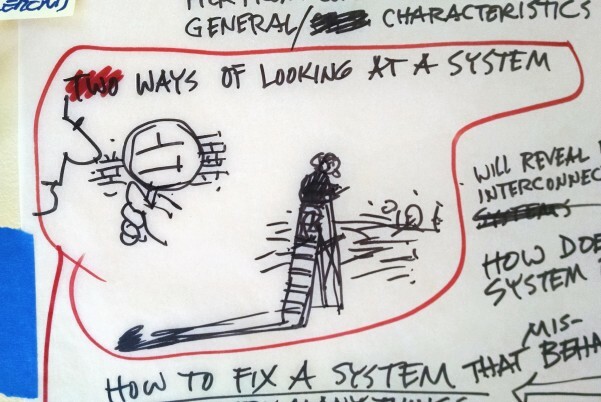 Last summer we developed a simple, everyday story to create curiosity about “systems” and systems thinking. 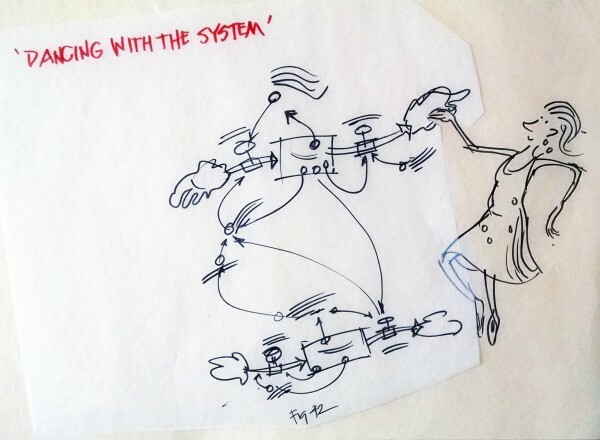 The result was the video “In a World of Systems”, narrated and illustrated by award-winning illustrator David Macaulay (of “How Things Work”) and developed in collaboration with systems educator Linda Booth Sweeney. The video is only a first step in the experiment of how to communicate systems and leverage points in new ways for young audiences, high school and college students, and young professionals in their early careers. This is a critical age, when people have a clearer sense of the complexity of current problems and when a systems perspective might help problem-solve and take action in a more holistic and effective way. We hope you enjoy it and can share it with your community! We explored looking at systems from multiple views. Taking a zoomed-in approach can help make stocks and flows and systems structures clearer, while a zoomed-out look is important for seeing how all the different pieces of a system–including those “under the surface”–relate and interact. It’s not always easy to recognize the systems around us or to know how to approach them. 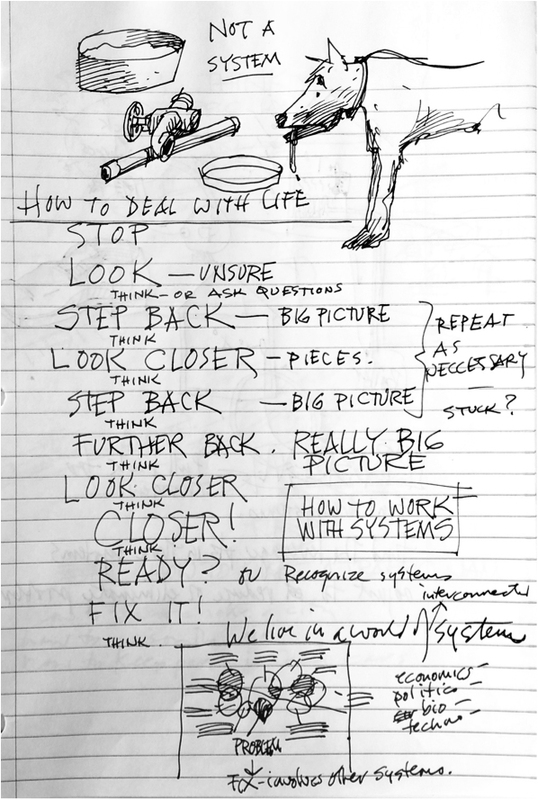 These notes demonstrate some of David’s ideas as he began to immerse himself in systems thinking. Even the simplest-seeming systems can turn out to be much more complex than first thought. Take this thermostat, for example–it may look like just a little box on the wall, but its switches are connected to the entire heating system of a building, including water pipes, electricity wires, and even the sensory perception of the building’s residents. Here, David took Dana’s concept of “dancing with systems” to give a rigid stock-flow diagram some movement and life (and a partner!). 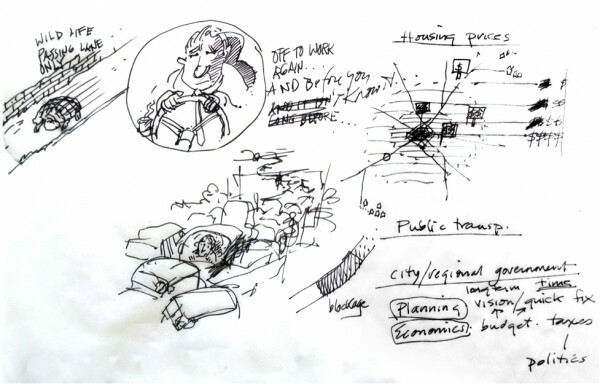 In this example, we explored a zooming out approach to reach the structures underlying a system. We started with the very everyday situation of a man stuck in traffic on his morning commute. Asking a series of “but why?” questions led us to realize that the system causing his slow drive was not just the narrow roads and other commuters, but also the lack of public transportation, the high housing prices in the city, and even the mindsets that dictate all office workers should be at their desks from 9-5. Early on, we used the common ideas of “chicken and egg” and “chicken crossing the road” to play around with representing different types of feedback. Chickens making eggs which then make more chickens is an example of reinforcing or positive feedback. An unlucky chicken crossing the road without looking for oncoming traffic is a small example of negative feedback that helps to keep the chicken population in check. In this feedback example, a positive loop of fish reproducing increases the overall size of a school of fish. At the same time, pressure from predators and fishermen form negative loops that decrease the size of the school. 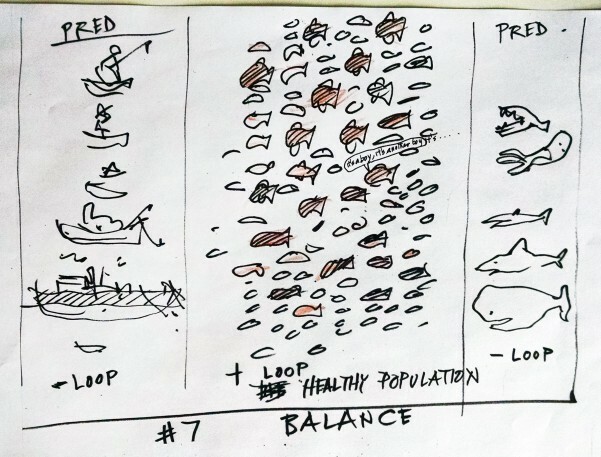 If these loops are in balance, the fish population will remain stable. 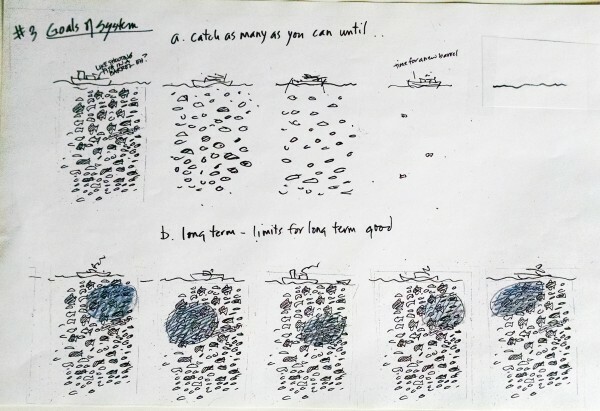 Here, David illustrates a quota that limits the number of fish an individual can catch, as well as a minimum size a fish has to reach before it can be legally harvested. 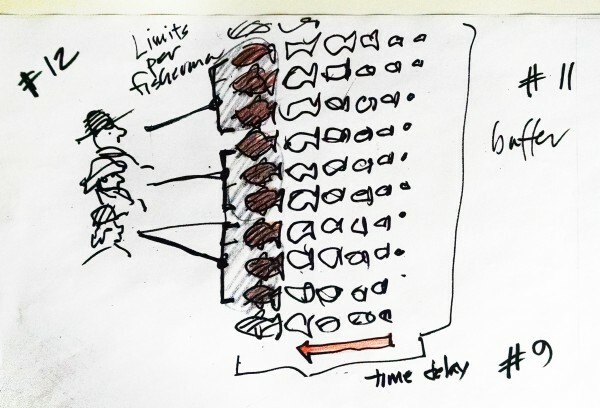 This example includes numerous leverage points, include constants and parameters (#12), the buffer of the total fish population (#11), and the time delay for baby fish to reach adult size (#9). Information flows are critical in systems. 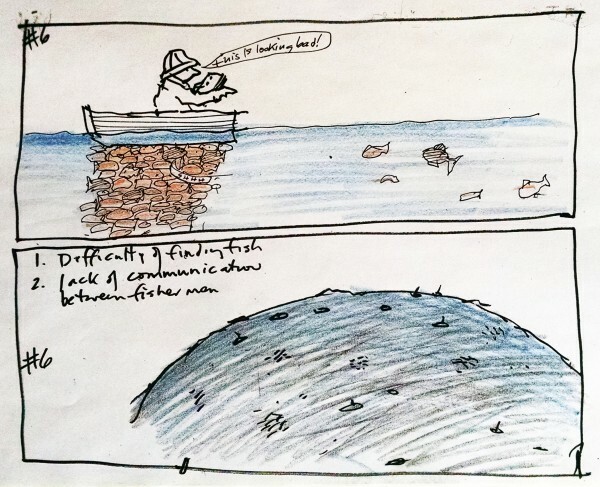 This humorous illustration gets at issues of information in a fishery system. How do we know how many fish are out there? How do we know if fish are being harvested sustainably? As you move up Dana’s list of leverage points from #12 to #1, they become increasingly fundamental and increasingly likely to create large and lasting changes in the functioning of a system. Goals, mindsets, and paradigms sit at the very top of the hierarchy of leverage points. The goals of a system can radically alter its behavior. Here, note the immense difference between a fishery driven by a “catch as much as you can” goal as opposed to one driven by a goal of sustaining healthy fish stocks for the long term.